The tomato was only exported from the Americas in the sixteenth century, but it quickly became a vital part of the European diet, especially among the poor. Here are nine humble dishes from across Europe (and beyond) that have become integral to their nations’ cuisine. Can you imagine a world without tomatoes? We eat them all the time, both raw and cooked, fresh and tinned, chopped and puréed. They are a vital ingredient in many of our favourite dishes, and are available year-round in all their glorious forms. But it wasn’t until the sixteenth century that they made their way out of South America, and no one grew them commercially in the UK until the 1800s. In just over 200 years, tomatoes have become one of the most important ingredients in Britain. Not bad for something that was originally considered poisonous. The Aztecs were growing tomatoes to eat as early as 700AD, but they were bright yellow and tiny. When they were brought back to Europe (either by Spanish Conquistadores or Jesuit priests – no one knows for sure), they were regarded as poisonous by the wealthy. One theory as to why this was places the blame on the pewter plates rich people would eat off; the acidity of the tomatoes would cause the lead in the plates to leech out into the fruit, poisoning whoever ate them. That’s why they were usually grown as decorative plants, until people realised the fruits were completely safe to eat and – most importantly – delicious. As wide-scale tomato production kicked off, it was the poorer people of France, Spain and Italy that ate them the most (perhaps because they weren’t eating off pewter). The fresh flavour, high nutritional value and availability of them meant they found their way into many simple, nourishing dishes that have since become culinary icons. Once canning and tinning methods were industrialised, they became even more available, being turned into something to enjoy year-round. But we would never have fallen in love with tomatoes like we did if it wasn’t for the tasty dishes that showcased them. The nine below are some of the most celebrated, and while they may have evolved or changed slightly from their original recipes, they prove that it wasn’t just Europe that fell in love with this beautiful fruit. Italy is the homeland of both tomatoes and cucina povera, a school of cooking that celebrates humble ingredients cooked simply, so you can find tomatoes being championed in almost every one of its twenty regions. 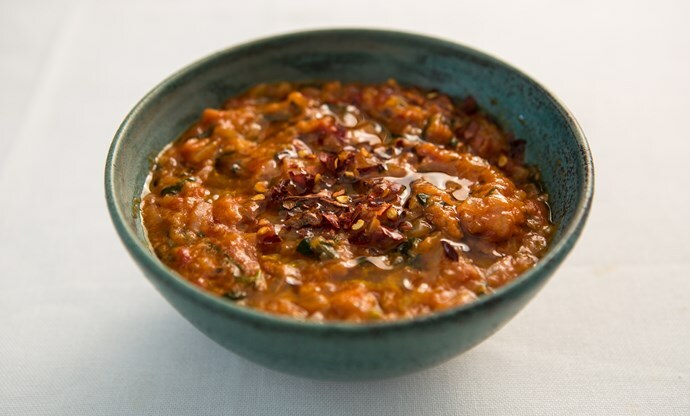 The most iconic, however, has to be pappa al pomodoro, a soup from Tuscany that was originally created to use up leftovers from the day before. It’s a combination of tomatoes and stale bread, which act as a thick base for the soup, before being flavoured with garlic, basil and olive oil. Traditionally these soups would have been made by chopping up fresh tomatoes (the recipe has ancient origins), but today tinned Tuscan chopped tomatoes are almost always used. 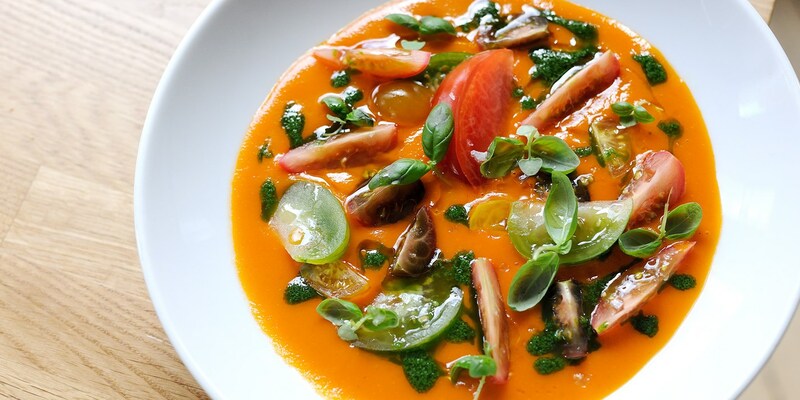 Another soup born out of peasant traditions, gazpacho is an iconic Spanish dish due to the fact it’s served chilled. Originally from Andalusia, it was originally a mixture of stale bread, garlic, olive oil and vinegar, but when tomatoes became available in the nineteenth century they quickly became an integral part of the recipe. Today, gazpacho is prepared by blitzing together vegetables such as cucumber, pepper and onion with plenty of raw garlic, stale bread to thicken, tinned tomatoes, olive oil and white wine vinegar. It can be puréed until smooth or left chunky, but none of the ingredients should ever be cooked. In France, a country known for its rich, buttery sauces, ratatouille offers something a little lighter and fresher. 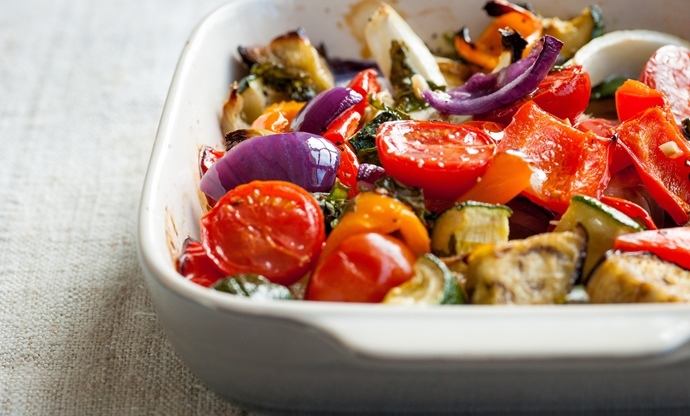 Originally from Nice in the south, it’s a combination of aubergines, courgettes, tomatoes, onions and peppers, fried in plenty of olive oil with lots of garlic and basil (or other fresh herbs). The type of tomato included depends on how you like your ratatouille; if you like it fresh and crunchy, then fresh tomatoes are sliced and fried, but if you prefer it to be more like a stew, use tinned peeled plum tomatoes – just make sure you drain them before adding them to the dish to stop it from becoming too jammy. 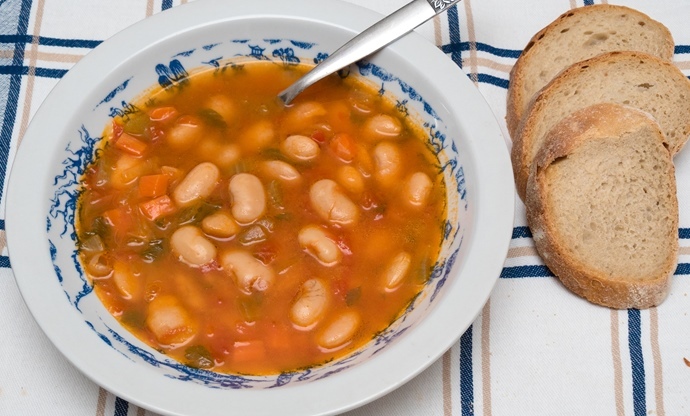 Greece is where you’ll find some incredible bean dishes, and fasolada has to be the most common. Ancient Greek in origin, it is incredible simple to prepare – just simmer beans, carrots and onion in a tin of chopped tomatoes until soft and cooked through, then add some olive oil at the end. Recipes vary from family to family, with bay leaves, parsley, celery and all manner of other vegetables and herbs included. But at its heart, fasolada is a simple bean and tomato stew. 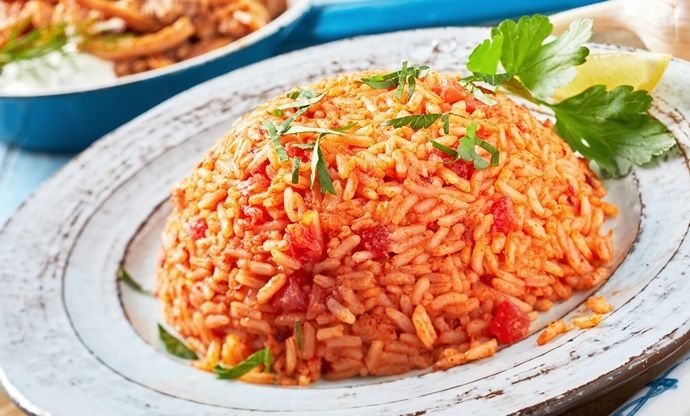 The Portuguese serve rice as a side to many of their favourite dishes, but don’t expect a bowl of plain steamed grains. Arroz de tomate is an almost daily staple, and sees long-grain white rice cooked with sautéed garlic and onion in stock flavoured with plenty of finely chopped tomatoes. Traditional recipes take the flesh of fresh tomatoes and blitz them into a pulp before adding to the pot, but many cooks who don’t have the time to blanch, peel and purée simply add some smooth sieved passata instead. We tend to associate tomatoes and peasant cooking with the Mediterranean more than anywhere else, but they’ve found their way into eastern European dishes too. 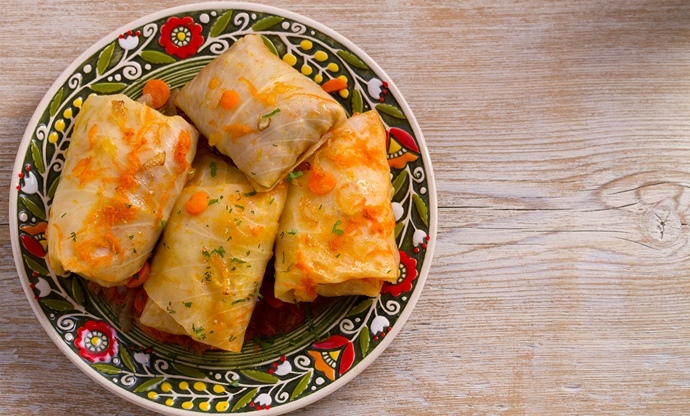 Gołąbki are the Polish version of stuffed cabbage rolls, which can be found throughout Europe, the Middle East and even parts of Asia. Ground pork, cooked rice and finely chopped onions are mixed together before being wrapped with large boiled cabbage leaves to create a parcel. These are then simmered in stock until cooked through, before being drained and served on a bed of herby tomato sauce. Passata or blended tinned Pomodorini tomatoes would work well for creating the sauce – just simmer it down until thick and rich. 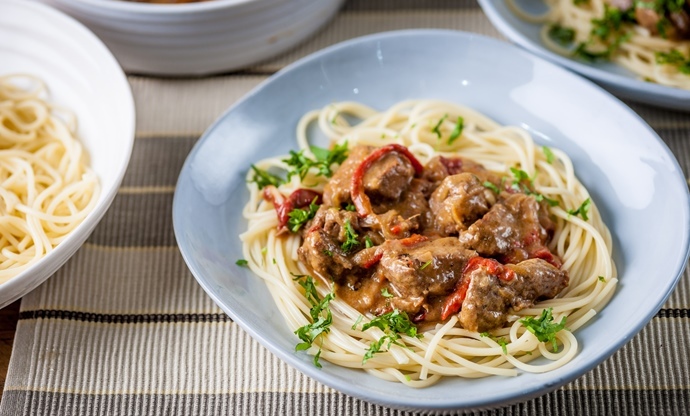 Goulash is Hungary’s most famous dish, boasting a hearty bowl of stewed beef flavoured with a huge amount of paprika (perfect for cold winter nights). It originally relied on wine or stock to create the sauce, but once tomatoes reached eastern Europe in the beginning of the twentieth century home cooks started using chopped tomatoes to create a thicker, lighter sauce for the beef to cook in. Simmering a tin or two of chopped tomatoes with plenty of paprika, garlic and onion as the beef gently softens until meltingly tender is how many of us know goulash today (even if it's not strictly traditional). 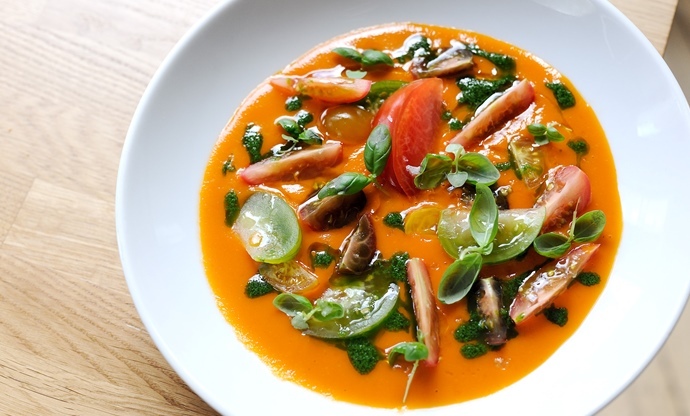 Peasant food is a European phenomenon, but seeing as the tomato was first discovered in the Americas, it’s only fitting that one of its own dishes features it so prominently. 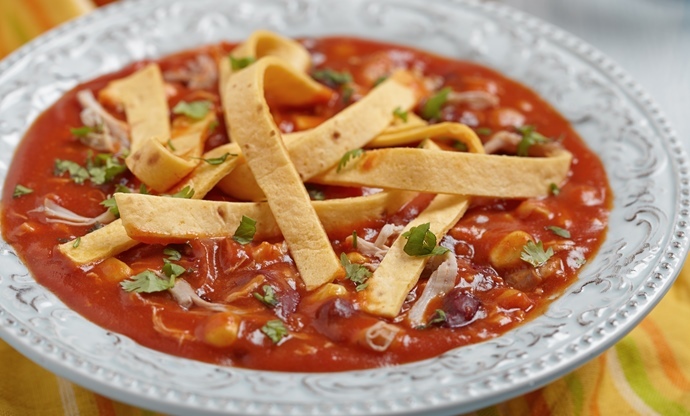 Tortilla soup is a much more modern invention than dishes such as pappa al pomodoro or gazpacho (it originated in Mexico City in the mid-twentieth century), but it has always been known as a humble Mexican (and now Tex Mex) speciality. The soup itself is made from chopped tomatoes, onion, garlic, chicken stock and smoked dried morita chillies, which are simmered and blended until smooth. Strips of tortilla chips are scattered over the top to act as a sort of crouton, and more modern variations also include avocado, kidney beans, chicken breast and sour cream. Indian curries are loved all over the world, but the vast majority found in the country itself are simple, vegetarian and filling. Pav bhaji was created to feed hungry labourers who needed to eat on-the-go. Originally from Mumbai, it first appeared in the 1850s and consists of a thick vegetable curry served in a pav, a type of bread roll. The vegetables (usually cauliflower, potatoes, carrots, peas and green beans) are boiled until soft then roughly mashed or left whole. Onions and spices are fried in ghee before finely chopped tomatoes – tinned, puréed or fresh – are added with chillies. The mashed (or whole) vegetables are added at the last minute to help thicken the curry, which is then spread generously onto the buttered roll. 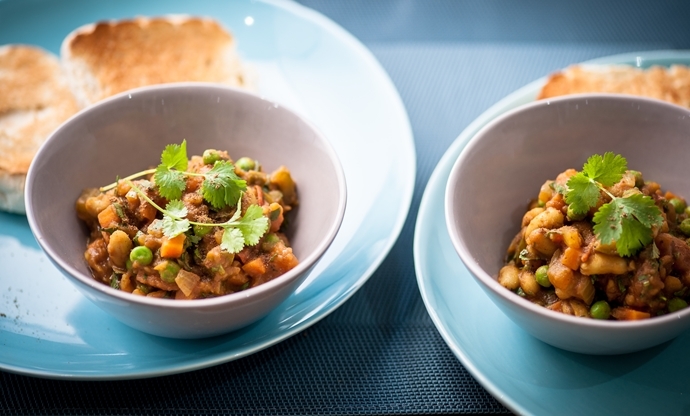 It’s become such a popular dish that you’re just as likely to find pav bhaji in a restaurant as you are at street food stalls.